This article is about the hold. For the city, see Winterhold. Winterhold is a hold in northeast Skyrim, with its capital in the city of Winterhold. It is initially affiliated with the Stormcloaks, but can be captured by the Imperials after completing Rescue from Fort Kastav. 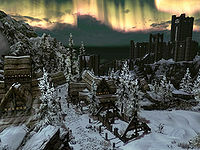 Winterhold is the northernmost hold in Skyrim, and has weather to match. The Sea of Ghosts is off the northern coast, Eastmarch is to the southeast, and the Pale is to the south and west. Perhaps the most notable feature of Winterhold is the College of Winterhold, a fortress-like school for mages which was spared on a rocky outcropping even though the Great Collapse tore down most of the capital around it. All that remains of the once-great city are four still-standing buildings (and the collapsed remains of several others) near the entrance to the College. 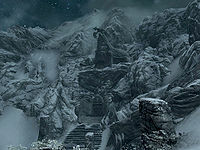 Winterhold consists of snowy coasts and even snowier mountains. 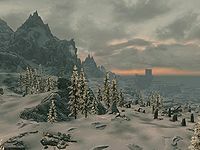 To the west and southwest is the Winterhold mountain range, which marks the border between Winterhold and the Pale, and some of the northern border with Eastmarch. Between the mountains and the sea to the east lies a tundra, where the elements have rendered the landscape barren and lifeless. Rock and ice shelves, and occasionally shingle beaches, form the barrier between Winterhold and the sea to the north and east. To the north the tundra stretches out into the Sea of Ghosts, forming one of the most inhospitable environments in Skyrim. Not many plants or creatures can survive Winterhold's harsh continental climate, and the hold is generally devoid of life as a result. The only plants that really makes a home in the mountains are the snowberry bush and some blue mountain flowers. By the coast the nordic barnacles, clams and spiky grass thrive. The area around the Wreck of the Winter War is known to be rich in fish and dragonflies and a large, isolated population of salmon can be found by the coast. As for large fauna only the hardiest of creatures make their home in Winterhold, such as wolves, ice wolves, snow bears, snowy sabre cats, and horkers. Occasionally, an unlucky traveler might also stumble upon an ice wraith, or worse, a wispmother. There is only one main road running through Winterhold. 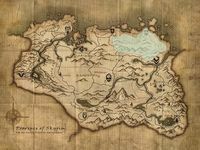 It originates as a branch of the Whiterun-Windhelm road. It runs northward through the eastern side of the hold right to the city of Winterhold. Another smaller and less used road runs from Winterhold to the ancient ruins of Saarthal. All locations in Winterhold with individual map markers are listed. There are a few places without map markers listed for their significance. There are four Shrines in Winterhold. A Shrine of Arkay near the Winterhold Stormcloak Camp. East of Hob's Fall Cave. East of the Tower Stone.